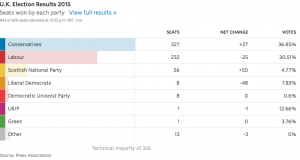 Prime Minister David Cameron’s party projected to win 316 seats; 239 for Labour. Prime Minister David Cameron’s Conservative Party drew far stronger support than expected in the U.K. election Thursday, exit polls and early returns indicated, suggesting the Tories will continue to lead the government after a tight campaign. The exit polls forecast the Conservatives would win 316 seats in Parliament, while the main opposition Labour Party would get 239. Meanwhile, the returns showed the Scottish National Party rolling to its best-ever U.K. election result, flattening Labour in an area it had traditionally dominated. “This is clearly a very strong night for the Conservative Party,” Mr. Cameron said in a speech in his constituency, with two thirds of the results in. Such a showing would be a far different result than the dead heat predicted in months of pre-election surveys. However, the Conservatives, on their own, could still be short of a majority in the 650-seat lower house. If the results hold, the election could have a far reaching, landscape-shifting impact on U.K. politics. If Mr. Cameron remains as prime minister, he owes voters a referendum on whether to stay in the European Union. Mr. Cameron opposes leaving the EU, but some vocal members of his own party are pushing for an exit. In London, maverick Mayor Boris Johnson won a parliamentary seat, making him a favorite to succeed Mr. Cameron as Conservative Party leader down the road. Official results were expected to continue to roll in Friday.